My Motorrad: Final Drive: Groupon or Groupoff? 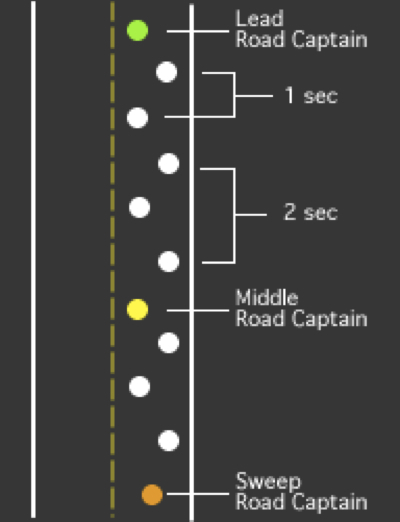 If the group is large enough, there will be a Middle Road Captain. Slower riders are usually put in the back and if the lead captain is sane, the group will be broken into smaller groups when the number gets much more than a dozen. Unfortunately, this is not the case many times and it can get hairy very quickly. I have ridden in groups as large as 38 motorcycles and it was an experience I will not soon forget. There was rain, grades as steep as 12% and speeds at or greater than the posted speed limit. In general, I don't like group riding. To me it's like herding cats. Why bother? As a group, motorcyclists or bikers are supposed to be the most individualistic people in our society. You'd think they'd be more inclined to ride solo, but like hungry cowboys hearing the ring of the dinner bell, when it comes to a group ride, they respond. It's a dichotomy that I may never understand. I do ride with a group once a week during riding season and while the number of motorcycles are relatively small, usually from 8 to 12 motorcycles for a given ride night, I still find it frustrating because of not only the too diverse riding abilities, but also expectations in terms of riding style. 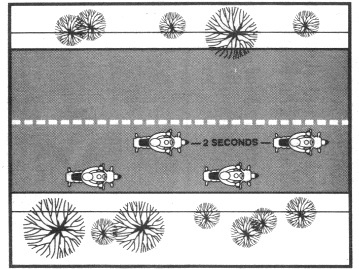 Many times it's like riding in a funeral procession, and depending on who is leading, it can mean that we will ride 60 mph on the interstate, yet exceed the speed limit on back roads. Of course you're saying "he's a malcontent that doesn't lead", but I tried that too. 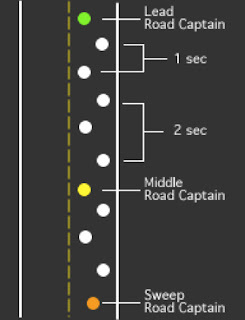 At the time, the person that normally led the group was in number two position and when we hit a 4 lane highway with a 65 mph speed limit, I decided to go 60ish and I looked in the mirror to see the normal road captain going what was 50 mph if that in a 65mph zone, with the group falling behind. First off, this is dangerously slow for the road in question and whatever lesson that was intended didn't sink in. After than I never led again, nor will I, at least with that group. Life is too short to willingly deal with control freaks. I guess my point here is that while there are specific, useful and necessary guidelines to riding in a group of motorcycles, you really need to assess your needs and riding style before taking off on a ride with a group. I would also suggest that anyone assess their riding abilities as if bad things happen, it's not just you. Group riding isn't for everyone and in spite of my protestation and complaints, I still ride with a group once a week as I have a good time with the people involved once we make it to our destination (food based) and my oldest daughter likes to ride pillion too. So, is it group on or group off? You decide. To those that are members of BMWMOA and read ON Magazine, I saw the article on group riding (much to my dismay as I had this in the pipe over a week ago), but I have not read it yet. Now I will.